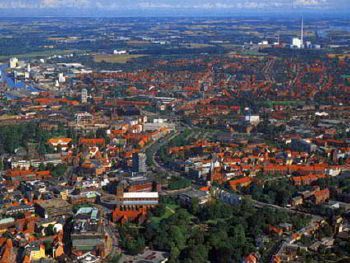 Odense is the main city of the island of Funen in Denmark. Odense cherishes the memory of his son - the great storyteller Hans Christian Andersen. Odense' citizens are really proud of this fact, because of the tourist well-developed infrastructure associated with the name of Andersen. On Munkemmelestred 3 there is a small house where he spent his childhood, from 1807 to 1819. Today there is a small museum, a branch of the main museum of Andersen. 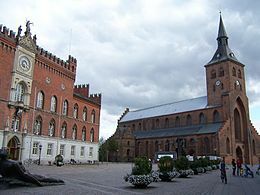 The Cathedral of Odense or the Church of Saint Knud, dedicated to the patron saint of Denmark Knud IV of the Holy, is considered one of the outstanding examples of brick Gothic architecture in Northern Europe. One of the most stunning sights of the city, especially for those who are interested in the history and ethnography of Denmark, is the open-air museum of the Fün village. The main goal of the museum is to preserve the social and agricultural history for the future generations by the example of village farms of the 19th century. These are just a few places one can explore in Odense and there are many more to discover but it will be really impossible to do it if not on a hired minibus driven by a skillful driver. 8rental is one of the car rental suppliers, which can provide the most suitable fleet that comes together with our chauffeur service. Our presence on the specific market has made our customers to always come back to us and our services. If you are looking for the first time for rental service in Odense, be sure not to make mistakes by looking at various companies that you might think could be the best. Most of the companies may be the best in providing minibus hire services but you may end up to nowhere if you are in this city for the first time. Send us a quote right now and book a minivan with a driver provided by our company and we assure you with a completely stress-free travel! To Rent a minibus for 24 passengers is quite easy, all is needed is to book one of them in advance on our company's website - the rest of the job is for the customers' service. We are serving you right got your arrival in Odense. The driver of the company will arrive on the chosen minivan directly to the airport to meet our customers. From the airport, he will take tourists to any designated place, and thanks to the amenities in the minibus cabin every passenger can comfortably spend time traveling with company. Minivans of the company differ from other by their modern design and reliable work during the trip. All of them are equipped with all safety and comfort facilities, which gives a 100% guarantee for every tourist that the trip will be the most comfortable and safest as any other trips they had. 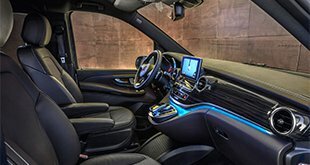 The journey through Odense will be even more comfortable and productive with a reliable chauffeur, who will quickly and efficiently take passengers to any desired place in the city or take a tour of the most exciting places. 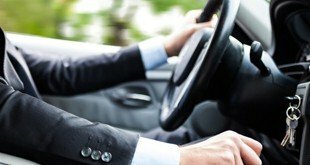 Any tourist will appreciate the unquestionable professionalism of the driver, his punctuality, reliability, and conscientiousness and on top of that, the communication process will be easier due to the fact that all drivers speak at least one of the international languages. They are always ready to provide a reliable, fast and safe trip through the city of Odense to each of the company's customers. Rent a reliable minivan with a driver and you will see how perfect your trip through the city of Odense can be!